Have you ever heard about the heat index? It’s basically the summer version of the wind chill factor. When a weatherperson mentions the heat index on the news, they’re talking about how hot it feels outdoors. The heat index, also known as the feels like temperature, is extremely important for people who spend time outdoors during hot weather. Whether you’re on vacation, working outdoors, or exercising outside, the heat index tells you how comfortable or, should I say, uncomfortable you’ll feel outside. 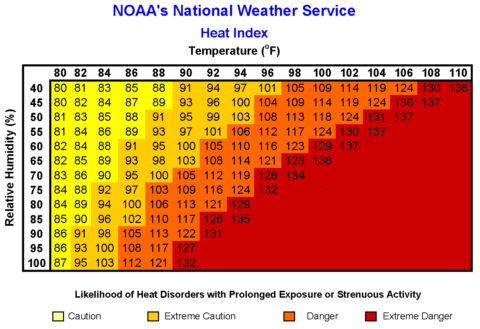 The heat index is especially vital during the summer months and when heat waves occur. The dew point is a measurement that relates to how humid it is outside. The higher the dew point is, the more uncomfortable it feels outdoors. A dew point of 55 degrees or lower feels pleasant. Dew points of 56 to 60 degrees feel comfortable. If the dew point is 61 to 65 degrees, the air will start feeling sticky. When dew points reach 66 to 70 degrees, it feels uncomfortable outdoors. A dew point of 71 degrees or higher feels oppressive. The dew point (when related to the air temperature) provides a data point called relative humidity which expresses how much water vapor the air can hold. Because the heat index factors in both the air temperature and relative humidity, 2 days during which the temps reach 90 degrees may not feel the same to you and me. A 90-degree day when the relative humidity is, say, 40%, results in a feels-like temperature (or heat index) of 91 degrees — which won’t necessarily feel very oppressive to many people. But a 90-degree air temperature combined with 75% relative humidity means the heat index will be 109 — which is dangerously hot for just about everybody. Here’s another Heat Index Calculator. So, you’ve seen why the heat index is important. And you know how to calculate the heat index on your own. Here’s a quick summary of how the heat index works. Moist air makes it feel hotter outside than the air temperature may suggest, because the higher the relative humidity is, the harder it is for your body to sweat efficiently. On a hot, dry day, your sweat will evaporate more quickly and help cool you off. On a hot, moist day, your sweat won’t evaporate quickly enough to help your body feel cooler, and it will therefore feel more oppressive outside. By the way, the heat index was first conceptualized in 1978 by Robert G. Steadman, and it came into widespread use during the 1980s. 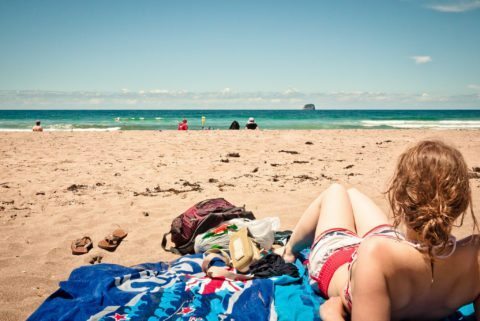 Some people worship the heat — they move to Florida and feel chilly if it gets cooler than 70 degrees. Others feel like they’re on the verge of heat stroke after things heat up much above 80 degrees. Of course, those are people’s personal preferences. And while some may love the heat and humidity while others hate it, there is a certain threshold at which the human body simply can’t take the warmth. Hyperthermia is a serious problem, especially for older people who may not have access to air conditioning. This is an especially serious problem in places like the Midwest and New England, where summer heat waves can send heat indices to 110 or more, yet many residences in those regions lack air conditioning. On days when it will be too hot for your comfort, try to limit your time outdoors, drink plenty of fluids, and keep your air conditioner on. Avoid alcohol and caffeine, which can dehydrate your body and alter its normal functions. Shower and bathe with cool water. Rest in a cool, shaded location. If you don’t feel well, go to the doctor or an emergency room. Video: Why Does Heat Index Matter?